Over the past nine years, advocates and homeless shelter workers from around the country have received news reports of men, women and even children being harassed, kicked, set on fire, beaten to death, and even decapitated. From 1999 through 2007, there have been 774 acts of violence by housed people, resulting in 217 murders of homeless people and 557 victims of non-lethal violence in 235 cities from 45 states and Puerto Rico. Who Commits Hate Crimes and Violence against People who are Homeless? Most hate crimes/violent acts are committed not by organized hate groups, but by individual citizens who harbor a strong resentment against a certain group of people. Some are “mission offenders,” who believe they are on a mission to cleanse the world of a particular evil. Others are “scapegoat offenders,” who violently act out their resentment toward the perceived growing economic power of a particular racial or ethnic group. Still others are “thrill seekers,” those who take advantage of a vulnerable and disadvantaged group in order to satisfy their own pleasures. Thrill seekers, primarily in their teens, are the most common perpetrators of violence against people who are homeless. Age Ranges of the Accused/Convicted: 10(two), 11, 12, 13(three), 14(eight), 15(eighteen), 16(eleven), 17(eleven), 18(fifteen), 19(eight), 20(seven) 22(three), 23, 24(six), 25(five), 27(four), 28(two), 29(two), 30, 32 (two), 33, 36, 47, 61, 62. 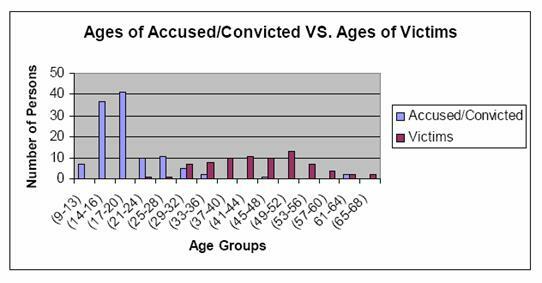 Age ranges of the victims in 2007: 22, 26, 29, 30 31, 32(four), 33, 34, 35(five), 36, 37, 38(two), 39(three), 40(four), 41, 42(three), 43(three), 44(four), 45(two), 46(two), 47(three), 48(three), 49(seven), 50(five), 51, 53(two), 54, 55(three), 56, 57, 58 (two), 59, 63(two), 68(two). **On February 23, 2007, San Diego police arrested 61-year-old Michael Nash near his home in conjunction with the disfigurement and killing of Allen Burton Hawes, a 57-year-old homeless person. Investigators believe the two knew each other, but they have not been able to establish a clear motive. Some neighbors say that he may have been gay; however, the police have not commented on whether sexual orientation played a role in the murder. Nash pleaded not guilty to the crime. ** On September 3, 2007, in Reno/Sparks, Nevada, two teenagers were arrested for the beating death of a homeless man. Christopher Michael Maciolek, 19, and Finley Byrdette Fultz, 18, were booked on suspicion of open murder in the beating and stomping to death of James Beasley, 55. Witnesses say the two attackers beat a homeless man at Wingfield Park, and then walked to nearby Brick Park where Beasley was sleeping on a bench. They kicked and stomped on Beasley’s head and torso. Both teens are suspected in the beating up two other homeless people on Labor Day. One victim didn’t file a police report in order to not to be known as a “snitch” to the police. This victim was beaten up by a group of men as he was sleeping. The man suffered leg fractures. Another man reported he was awakened along the banks of the Truckee River by a group of younger men who were beating his legs with either a bat or a stick. Mark Mallory, assistant manager for the Men’s Drop-In Center, said that seven of his clients, including the murder victim, Beasley, were assaulted by people believed to be housed. 1. Inclusion of housing status in the pending state and federal hate crimes legislation. 2. Awareness training at police academies and departments nationwide for trainees and police officers about the causes and solutions to homelessness and how to deal effectively and humanely with people experiencing homelessness in their communities. 4. A public statement by the U.S. Department of Justice acknowledging that hate crimes and/or violence against people experiencing homelessness is a serious national trend. 5. The U.S. Department of Justice issues guidelines for local police on how to investigate and work with people experiencing homelessness based on recommendations from the National Coalition for the Homeless and the National Law Center on Homelessness & Poverty. The U.S. Department of Justice recommends improvements to state law on how to better protect against violence directed at people experiencing homelessness, including tougher penalties. 6. With the assistance of the National Coalition for the Homeless, the National Law Center on Homelessness & Poverty, and criminal justice professionals, add “housing status” information to the checklist of data maintained as part of the National Incident Based Reporting System (NIBRS) maintained by the FBI. Similar efforts should be undertaken by state uniform crime reporting (UCR) agencies. Circumstances that contribute to or were responsible for the perpetrators’ behavior. Beliefs held by the perpetrators of these crimes and how their beliefs have changed since conviction. Thoughts and advice from the perpetrators to others who are considering hate crimes/violence against the homeless population. Factors in the community that may be contributing to targeting of homeless persons, such as measures that criminalize homelessness. Contributing factors to homeless persons’ vulnerability, such as lack of adequate shelter or housing, and ways to address those factors. Community education, prevention, and law enforcement strategies. 8. Cities should implement more constructive approaches to homelessness and not implement or enforce criminalization measures. 9. Our federal, state, and local governments should prioritize creating and providing adequate affordable housing and services to bring an end to homelessness in our communities. 1999: No More Homeless Deaths! Hate Crimes: A Report Documenting Violence Against Men and Women Homeless in the U.S.